Shortly after 1898 when Hawaii became a U.S. territory, the Army began construction of defensive works on the island of Oahu. Seven forts were built around the island to contain the massive coastal artillery pieces and mortars, along with the hundreds of anti-aircraft guns — a so-called “ring of steel” — that had been put in place to defend Pearl Harbor and the U.S. Pacific fleet anchored there. Soldiers of the now-defunct Coast Artillery branch manned those forts. They had been trained and equipped to repel an enemy landing fleet and battleships using their big guns. That defense was supplemented by attack aircraft from the Army, Navy and Marine Corps on carriers and airfields. Additionally, some 43,000 Soldiers stood ready to repel the enemy should they overcome the coastal defenses and make it to shore. On Dec. 7, 1941, 76 years ago, the Japanese launched their surprise attack on Pearl Harbor and surrounding installations on Oahu. It turned out that the Japanese never intended to execute an amphibious assault. Instead, they opted to attack from the sky, launching their aircraft from carriers positioned well outside the range of the coast artillery. 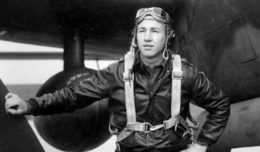 The first of two waves of some 360 Japanese fighters, bombers and torpedo planes began the attack at 7:48 a.m., having launched from six aircraft carriers north of Oahu. 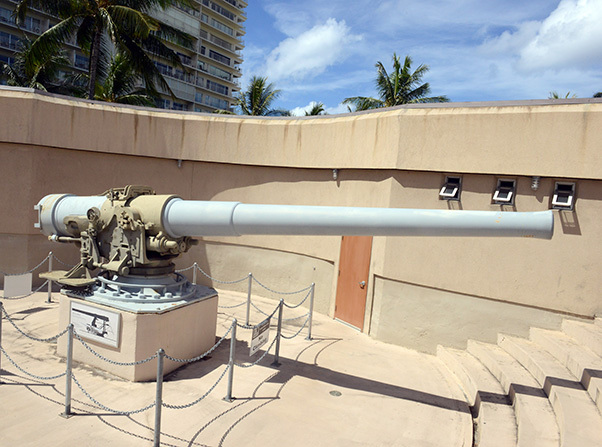 It took 115 Soldiers to man the two 14-inch guns on Battery Randolph on Fort DeRussy on Oahu, Hawaii. In 1944, the guns were scrapped and once the Army museum opened on the fort, two 7-inch guns, including this one, served as placeholders. The coast artillery pieces in the south were pointed out to sea and were incapable of shooting down fighter planes, particularly since they could only be raised to about 20 degrees, the effective angle for taking out approaching ships, according to Ian T. Frazier, a historian at the U.S. Army Museum of Hawaii. Among the 2,403 Americans killed, 2,008 were Sailors, 218 were Soldiers, 109 were Marines and 68 were civilians, according to a National World War II Museum Pearl Harbor fact sheet. Of the aircraft destroyed, 92 were Navy and 77 were Army Air Corps, most still on the ground. Two battleships were destroyed and six were damaged; three cruisers were damaged; one auxiliary vessel was destroyed and three were damaged; and three destroyers were damaged, according to the fact sheet. The carriers USS Enterprise, USS Saratoga and USS Lexington were out on maneuvers and were not spotted by the Japanese. Within minutes of the attack, Navy anti-aircraft guns opened up. The guns were firing at planes in all directions. A number of stray Navy anti-aircraft gun rounds fell in populated areas of Honolulu, killing more than a dozen civilians, according to James C. McNaughton, who served as command historian for U.S. Army Pacific from 2001 to 2005. Today, he is the director of the Histories Division at the Army Center of Military History. 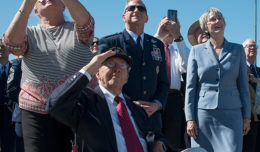 The Army’s anti-aircraft gunners at first struggled to engage the enemy because their guns were not in firing positions and the guns’ ammunition was in a separate location, where it was under lock and key, McNaughton said. “It took them a while, but some guns did eventually get into action,” he added. Originally, Battery Randolph had two massive 14-inch guns, which could be raised, rotated and lowered. Both had 50-ton counterweights that were used to assist in raising and lowering them, he said. 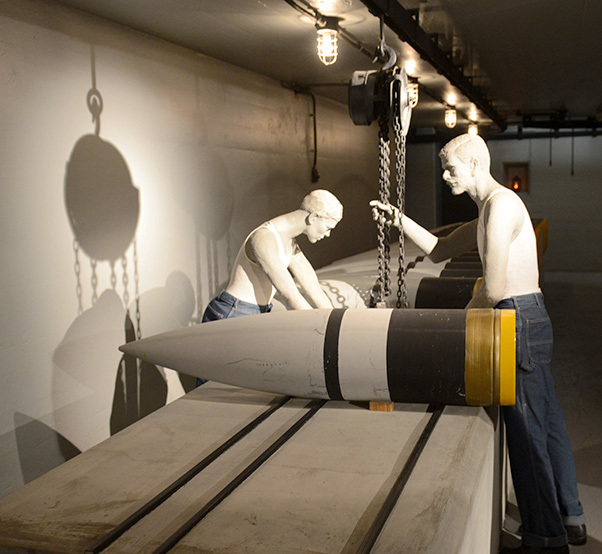 Each projectile weighed 1,600 pounds and was delivered from the powder room (shown here) using an electric hoist. During the war, the Soldiers in Hawaii — as in various places along the coasts on the U.S. mainland — never used coast artillery to repel a landing fleet, McNaughton said. The Army eventually disbanded the forts, along with the Coast Artillery branch, he said. Soldiers serving in the branch were transferred to air and missile defense and field artillery units. Besides standing down the branch, all of the forts on Oahu were abandoned except for one: Fort DeRussy, on Waikiki Beach. Fort DeRussy had two batteries: Dudley and Randolph, Frazier said. In1969, Battery Dudley was demolished by the U.S. Army Corps of Engineers. However, Battery Randolph proved too difficult to destroy, he said. It contained concrete walls 12-feet thick, which were too difficult to demolish with a wrecking ball. If explosives had been used, shock waves would have wrecked havoc on nearby resort hotels. The last time the battery fired, he noted, was during practice in 1944, and the blast wave from that firing broke a number of hotel windows. Shockwaves from pre-World War II test firings, he said, were strong enough to destroy all of the adjacent officer housing. In fact, before each test firing, the Army would publish its schedule in the local newspapers to warn residents of the blasts, he said. With prime real estate on Waikiki Beach and an indestructible fort on its hand, the Army decided to turn the fort into a museum, Frazier said. It opened Dec. 7, 1976, the bicentennial year of the United States and the 35th anniversary of the attack on Pearl Harbor. Waikiki Beach can be seen in front of Fort DeRussy. Originally, Battery Randolph had two massive 14-inch guns, which could be raised, rotated and lowered. Both had 50-ton counterweights that were used to assist in raising and lowering them, he said. Each projectile weighed 1,600 pounds and was delivered from the powder room using an electric hoist. For gunnery practice, the Army stationed target ships 14 miles out, he said. It took 115 Soldiers to man the two batteries, he said. Besides moving and firing the gun, others were stationed below to prepare and hoist projectiles up to the guns. Unfortunately, those guns were scrapped in 1944, he said. Today, two 7-inch guns serve as stand-ins. While most visitors to Hawaii are already aware of the USS Arizona Memorial there that commemorates the attack on Pearl Harbor, many of those same visitors are surprised to find out that there’s also an Army museum housed inside an old fort, Frazier said. Because the fort is located right on the beach, a lot of the average 350 visitors a day literally stumble upon it, he said, adding that there’s probably a lot more visitors than that because when the museum is closed, people can walk right up to the cannons, tanks and helicopters that are outside. 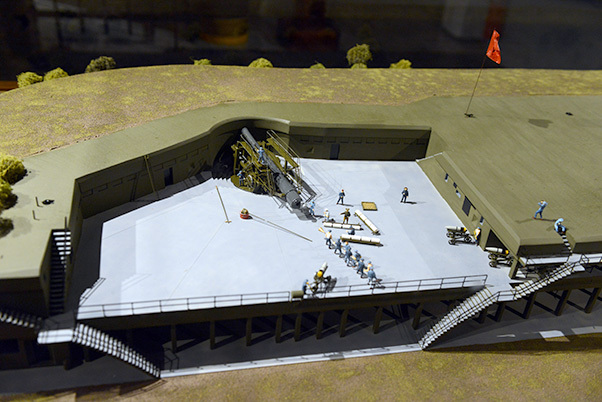 A model of Battery Randolph can be seen inside the Army museum in Fort DeRussy, on Waikiki Beach. Besides the massive coast artillery batteries, a second so-called ring of steel on Oahu during World War II was the extensive narrow-gauge railway network linking all of the Army and Navy forts and installations together with communities and ports on the south and west sides of Oahu. Tiny three-foot gauge trains carried troops, ammunition and supplies and were vital to operations during World War II, said Jeff Livingston, a former Sailor, Vietnam veteran, and volunteer at the Hawaiian Railway Society. Although most of the big guns and mortars were mounted in fixed positions, a few were mobile, mounted on railway flatcars, he noted. Some of the railways were operated by private companies and the Army and Navy ran their own railroad systems as well. The only remaining railway on Oahu still in use and operated by the military, Livingston said, is the underground two-foot gauge trains of the Red Hill Fuel Storage Facility. Those trains are operated by the Navy. That railway was used during World War II to supply fuel to the fleet at Pearl Harbor and it continues that mission today. 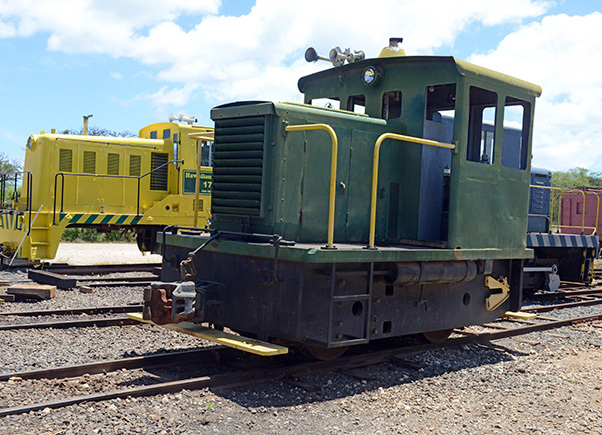 These ex-U.S. Army trains were used during World War II on Oahu. Today, they are run by the Hawaiian Railway Society on 15 miles of track at Ewa, Oahu. 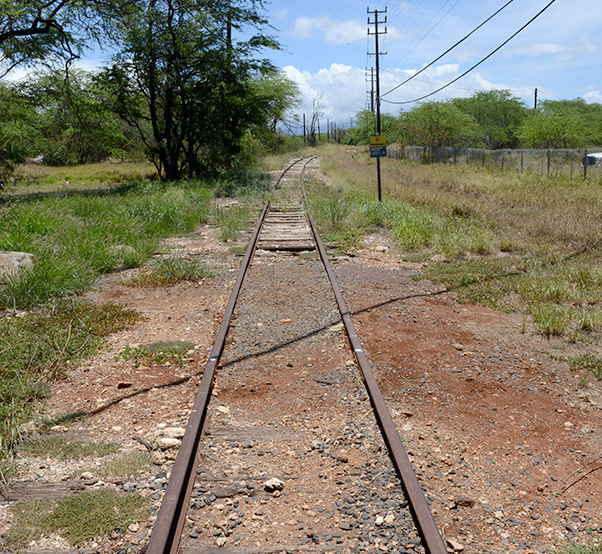 This three-foot gauge railway is run by the Hawaiian Railway Society on 15 miles of track at Ewa, Oahu. 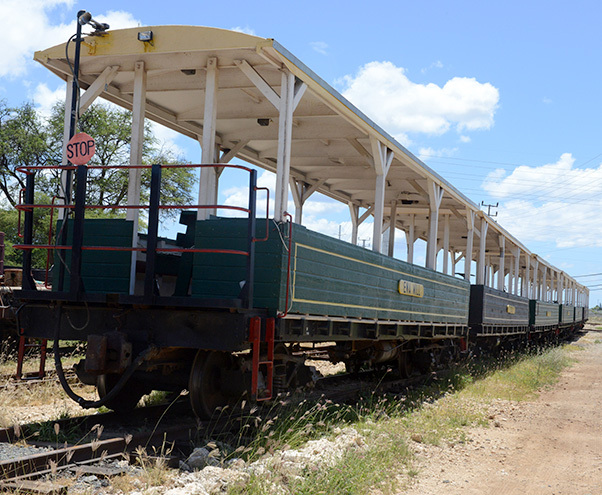 The railway was part of a very large network of railroads covering much of the island until the end of World War II.